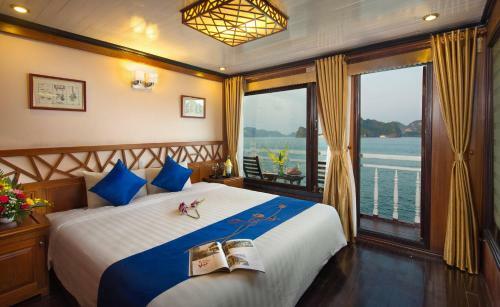 Featuring well-appointed rooms with oriental décor and modern amenities, Gray Line Halong Cruise offers a spacious sundeck and an in-house restaurant and bar. Free WiFi is available in public areas. This traditional Vietnamese cruise will set sail along Halong Bay, which is a 4-hour drive from Noi Bai International Airport and Hanoi City. The junk will board guests from Tuan Chau Marina Station Terminal. 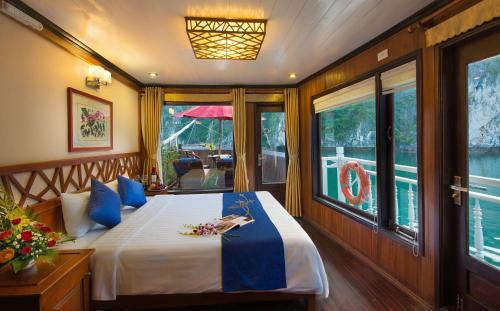 Gray Line Halong Cruise’s air-conditioned cabins are fitted with hardwood floors, a wardrobe and windows which open out to sweeping sea views. The attached bathrooms come with free toiletries and a hairdryer. A 24-hour front desk will be happy to assist with shuttle services and luggage storage. Guests can also indulge in water activities like – kayaking and fishing. Other activities include Tai Chi demonstrations and cooking classes. An array of local and international dishes can be sampled at the in-house restaurant. A selection of wines and cocktails are available at the bar.